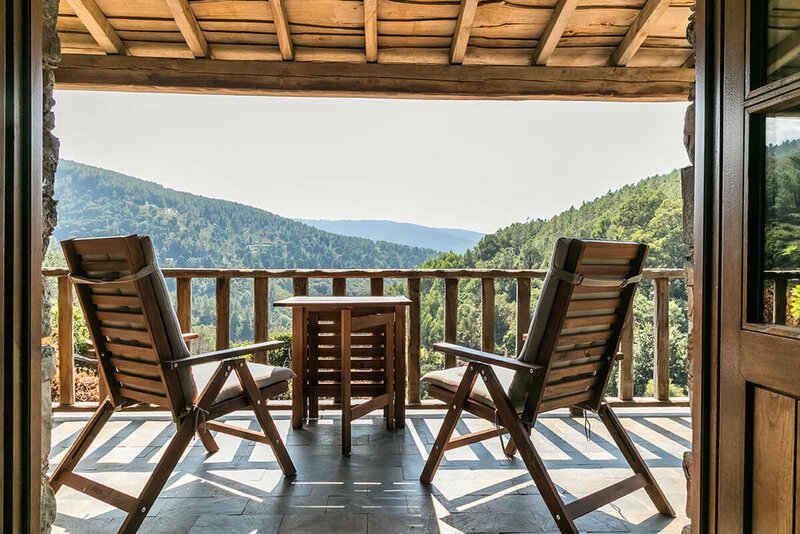 With a large balcony and a stunning view over the Cerdeira’s Brook valley, the Casa da Árvore is ideal for those who want nature’s colors dictate their inspiration. 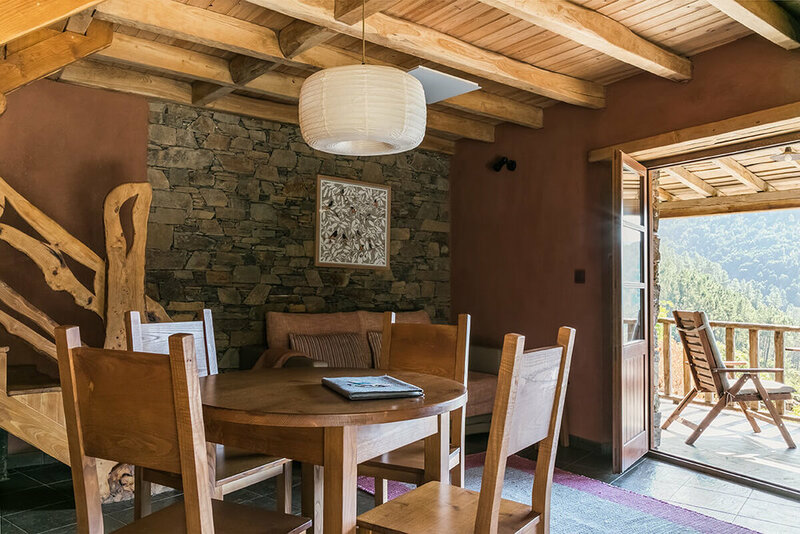 The entrance door on the ground floor leads directly into a social area with a kitchen, a dining table and a welcoming living area with a wood burner, an armchair, and a sofa bed. Through the stairs, you reach the second floor with a double bed, a bathroom, and another balcony, from where you can see the natural pool. With the artistic creations of António Fernandes and Vanda Vilela, nature is present in this house in a unique way. 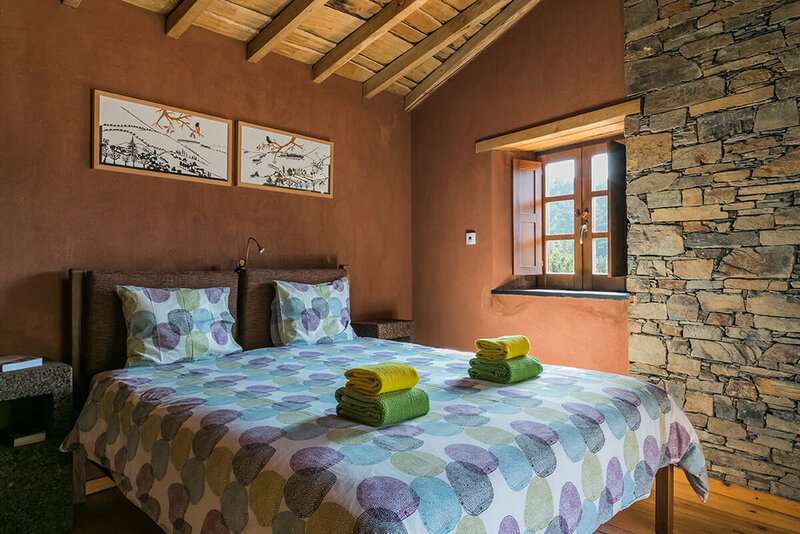 Like all the other houses in Cerdeira, the Casa da Árvore has been restored using ecological and regional materials and favoring the use of local contractors. All houses have central heating and offer great comfort both in winter and summer. In the kitchen, you will find basic staples such as salt, sugar, spices, olive oil and vinegar. To guarantee that you make the most out of the village’s quietness, we have chosen not to install TVs, radio or internet access in any of the houses. You can make your stay even more special by booking one of our creative experiences or joining one of the workshops we host throughout the year. António Fernandes, sculptor inspired by nature, lives and works in the Nogueira Mountains in Bragança, in the North region of Portugal. Antonio perfectly developed a unique way of sculpting wood by letting its natural patterns guide him over years. His deep knowledge of the wood’s properties allied to his great sensibility result in unique pieces. From furniture to musical instruments and sculptures. The staircase, bookcase and coat hanger in this house are all stunning examples of his unique talent. Similarly, Vanda Vilela, a painter who lives and works between Lisbon and Lousã is also moved by her great passion for nature and for one of its materials – paper. With her capacity for finding the essence of natural shapes, she composes her pieces with architectural precision by employing a scalpel and coloured paper. 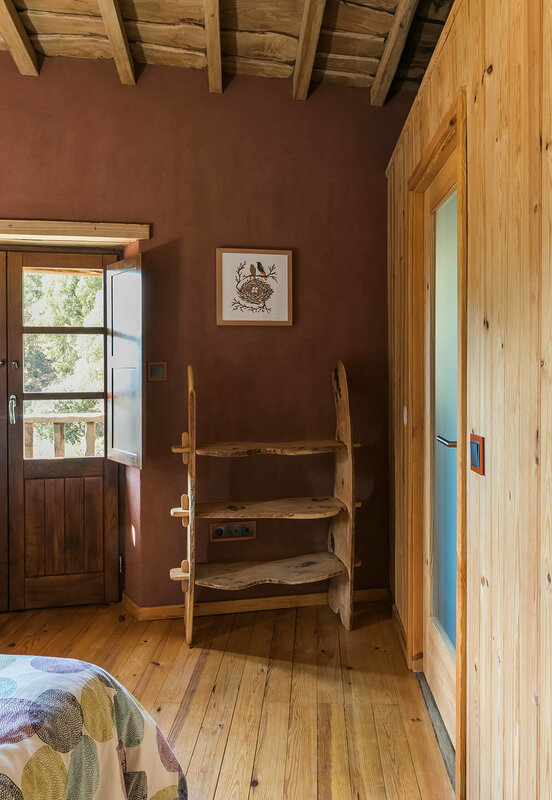 The theme of her creation in this house is the Redstart, a bird who frequently visits Cerdeira. * 2 night minimum stay | * 50% advance. * Prices are quoted per night and house for two adults, breakfast included. 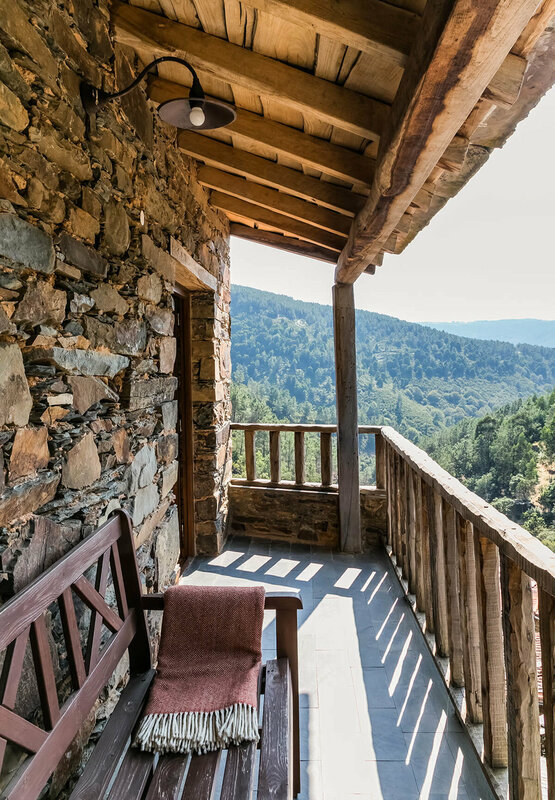 Additional charges for additional guests apply: 20€/night for adults, 15€/night for children up to 11 years (inclusive) and 10€/night for a baby cot, if needed. 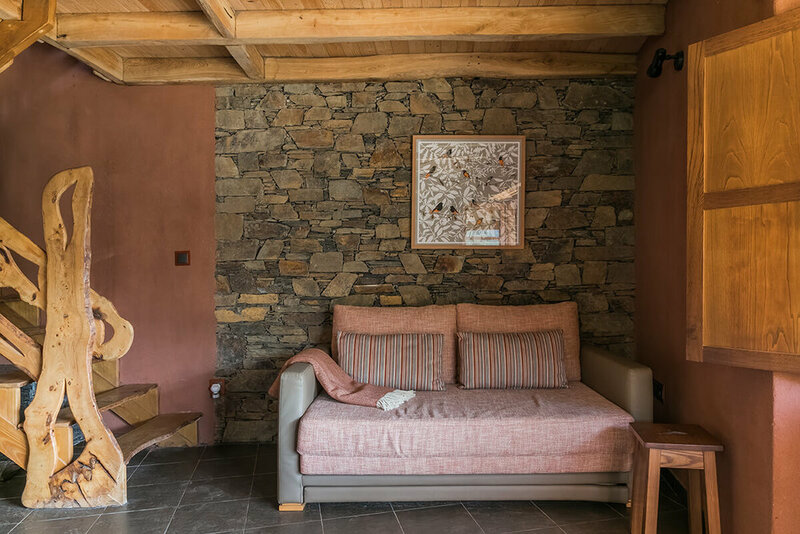 * Pets are welcome at the Casa da Escada or Casa do Forno or Casa da Janela for an extra charge of 10€/night. * For more information, read our FAQ. Note: Breakfast is served at the Café da Videira, where you will also have WiFi access.